Health is the unobstructed flow of life, nutrition and intelligence in a living organism. It is the state of complete physical, mental and social well-being, free from illness, injury or pain. Health concerns (aging, disease, exhaustion...) - What's common? Organisms age because cells accumulate free radical damage over time. 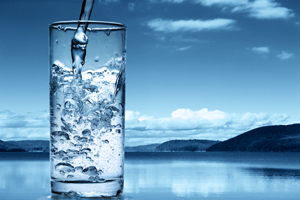 Free radicals... are everywhere around us and constantly attack our bodies, causing aging and deterioration. Free radical damage is oxidative damage. Free radical damage within cells has been linked to a range of disorders including cancer, arthritis, atherosclerosis, Alzheimer's disease and diabetes. DNA cross-linking can lead to various effects of aging, especially cancer. Other cross-linking can occur between fat and protein molecules, which leads to wrinkles. Free radicals can oxidize LDL and this is a key event in the formation of plaque in arteries, leading to inflammation, heart disease and stroke. 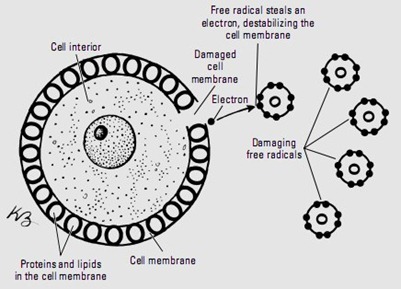 Free radicals are atoms or molecules that have a single unpaired electron on their outer shell. 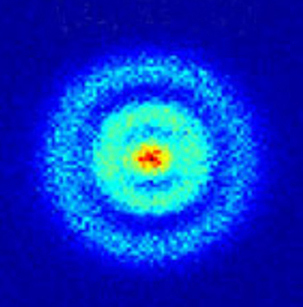 Most free radicals are highly reactive in their quest for electrons. If their hunger is not satisfied, they turn against the human body and try to steal electrons from its own cells. Free radicals breaking lysosomal membrane. Histamine leaks out. 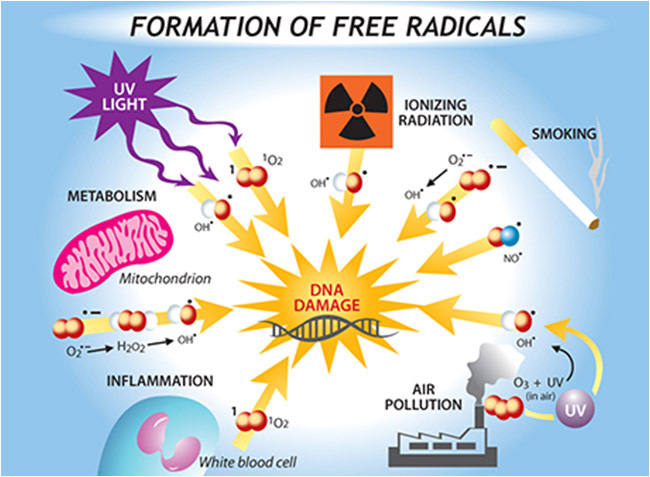 Free radicals breaking nuclear membrane altering DNA (genetic) material. 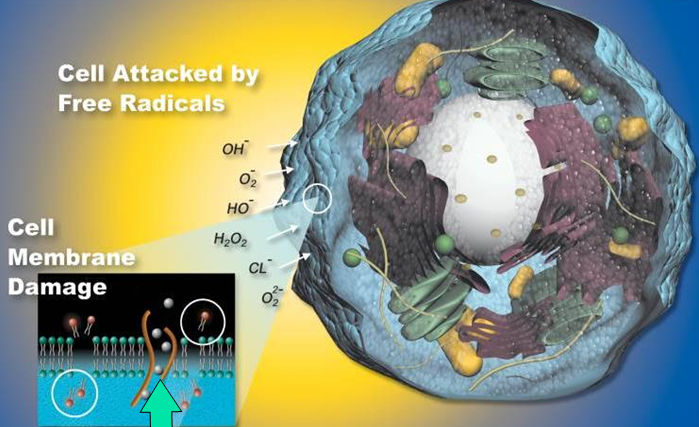 Free radicals attacking cell membrane from inside. Easy entry for destructive enzymes and pollutants. Free radical damage is oxidative damage. Reducing or preventing oxidative damage can extend lifespan. Antioxidants are reducing agents with free electrons to give. 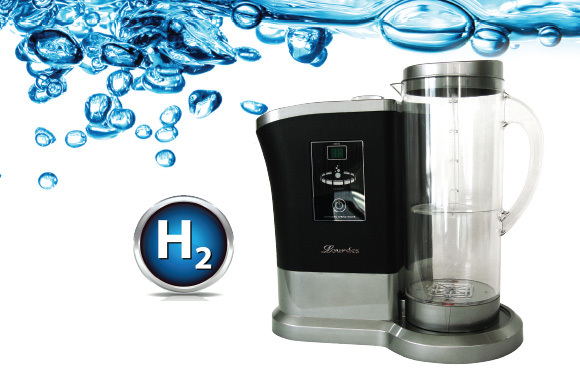 Therefore, by donating their electrons, thy can neutralize the harmful effects of the free radicals.